1. 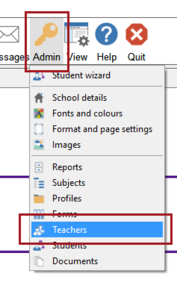 To change a teachers password click the Admin icon and select 'Teachers'. Double-click the teacher you want to edit. 2. Now you have a choice, you can either click the 'Generate password' button. 3. The program will then create an easy to remember password for you. 6. Once done, just click the 'Ok' button. It's recommended that your passwords contain a combination of uppercase letters, lowercase letters and numbers. This page was last modified on 21 April 2017, at 05:42.